A turbo trainer is a great way to use your bike indoors. By keeping the bike in place and applying resistance to the back wheel, you get all the benefits of cycling, even when the conditions outside are terrible. Fortunately, there are a number of budget turbo trainers out there that offer great quality without breaking the bank. If you’re looking for an affordable solution, here’s a look at 3 of the best turbo trainers under £100 available right now. This trainer is very easy to set-up, as it doesn’t require assembly. Furthermore, it’s also fold-able, so you can easily store it away after use. It can fit wheels from 26 to 28 inches in size, allowing for a wide range of bikes to be used. This trainer also offers noise reduction for a more pleasant experience. The magnetic resistance comes in 7 different levels, allowing you to quickly adjust the equipment to suit the exercise you require. With a size of 61 x 19 x 51cm, as well as a weight of 9kg, this is a lightweight design considering what it is capable of doing. In closing, this is a device that is designed to feel instantly familiar. Quick and simple to use, the various resistance settings ensure even seasoned cyclists will find something to enjoy with this product. This device comes fully assembled making it quick and easy to use. The quick release mounting also supports this. Rather than having to assemble and disassemble the trainer, just mount and dismount your bike easily and efficiently. As for the trainer itself, this folds over once, greatly reducing its size and giving you something that is much easier to store away. Folded up, it’s size is only 90 x 25 x 60cm. Despite all of these features, the product itself only weighs 7.1kg. The magnetic resistance is generated through multiple magnets, offering a smooth experience compared to trainers that focus on one singular magnet. Similarly, with 6 different resistance levels to choose from, there’s enough customisation to get the level of difficulty you need. While it is a little bigger, this is still a light design that manages to include a number of beneficial features, such as magnets, a quick release mechanism and 6 different settings. Great for any home, this will surely benefit any cyclist. 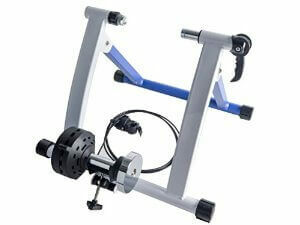 This turbo trainer works with wheel sizes from 26 to 28 inches, making it useful with a broad selection of bikes. With 5 levels, the magnetic resistance can be easily adjusted to the right level of resistance for you. This device also has a fold-able design, allowing you to simply fold it up and put it away, rather than having to take it apart. This is supported by the quick release skewer, allowing for easy mounting and dismounting. With a size of 50 x 55 x 40cm, as well as a weight of 9kg, this is a small and lightweight design that is easy to carry and store. With plenty of options, this trainer does exactly what you need it do. The design is strong, sturdy and robust – great for use with larger bikes. 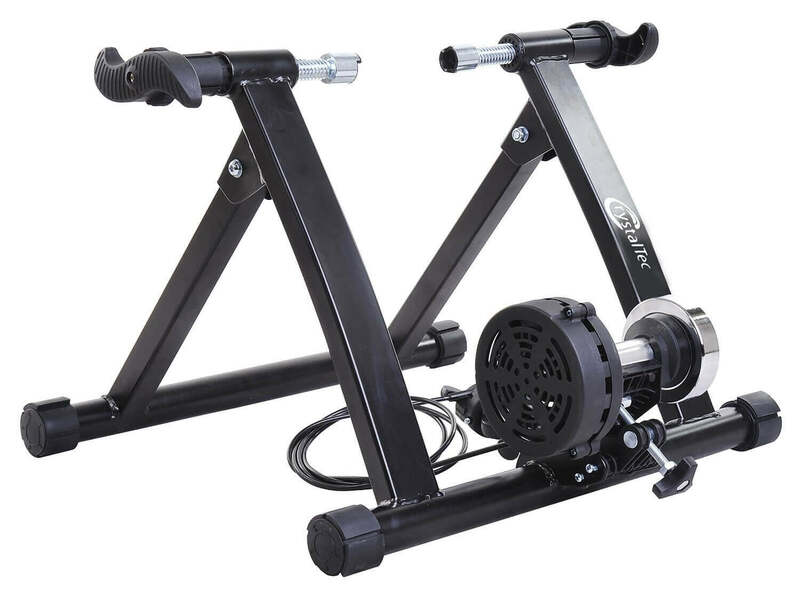 As you can see, it’s not hard to find a fantastic turbo trainer for under £100. That being said, after looking at some of the best options, there’s no mistake in giving the Magnetic Turbo Trainer first place on this list. For the price it sells for, this turbo trainer simply offers the best options and a design that is so simple to use and instantly familiar.